The Cost of Sizing a Ring Larger vs Smaller, What is Involved? People ask me all the time about the cost of sizing a ring larger vs sizing it smaller. In fact, over the last thirty years, I may have been asked that question more than any other. Unfortunately, there’s no easy answer. It’s like asking how much it costs to dine at a decent restaurant. Will you be ordering appetizers? Wine? Dessert? You and your spouse could spend $50. You could spend $200. There are many factors to take into account. So, for this blog I will cover the cost of sizing a ring larger, as well as some of the other variables that affect cost . Next week I’ll cover the costs of sizing a ring smaller. What is Involved in Sizing a Ring Larger? The first thing to consider when sizing a ring up is its size. By this, I mean how wide and how thick is the shank (the shank is the bottom part of a ring that sits under the finger). More metal will have to be inserted into a thicker, wider, and heavier shank than a thinner one. Since gold is selling for well over $1200.00 an ounce, the difference can be significant. The second factor to consider when sizing a ring larger is how many sizes up the ring is being sized. Going from a size 5 to a size 10 will cost considerably more than going from a size 5 to a size 5 ½. Much more metal will have to be used. 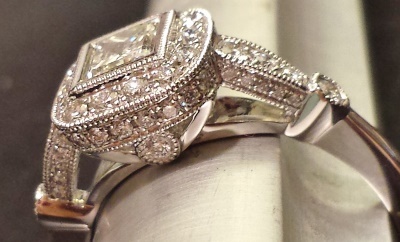 Generally any sizing over 2 sizes becomes more complicated by the need to change the original shape of the ring. This can effect mountings and design elements for the worse. The third issue in considering the cost is the amount of labor that will be involved. Typically, this constitutes the greatest part of the cost and since there are so many factors involved, I will divide these factors up and cover them separately in this post. 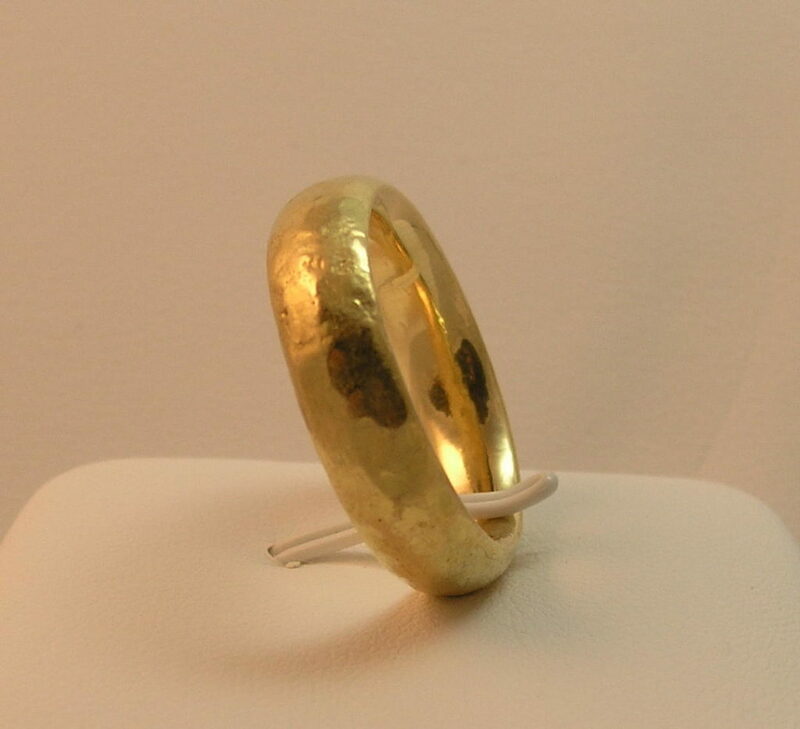 The range of cost for a simple minor sizing up of a thin gold ring with no gemstones: $45.00 to $85.00. What Effects the Labor Costs in Sizing a Ring? The cost of the labor is what largely determines the cost of the sizing. A simple, smooth, gold band will cost less to size than a big opal ring surrounded by multiple diamonds. A sizing that involves an alteration of less than one size will be less expensive. Diamonds, rubies, and sapphires are not as sensitive to the heat generated by the soldering process as some super sensitive gemstones. For this reason they can often be left in the ring during the sizing. Other stones, such as opals, tanzanites and emeralds, can’t take the heat and have to be removed before any heat can be applied. Any time gemstones have to be removed and then reset will add to the cost of the sizing. Range of cost to unset and reset the gemstones on your ring: $20 to $100. An alternate to this is to use laser as the soldering tool instead of open flame solder. This is more expensive, but a life-saver for otherwise unalterable rings. Some settings are easier to deal with than others. 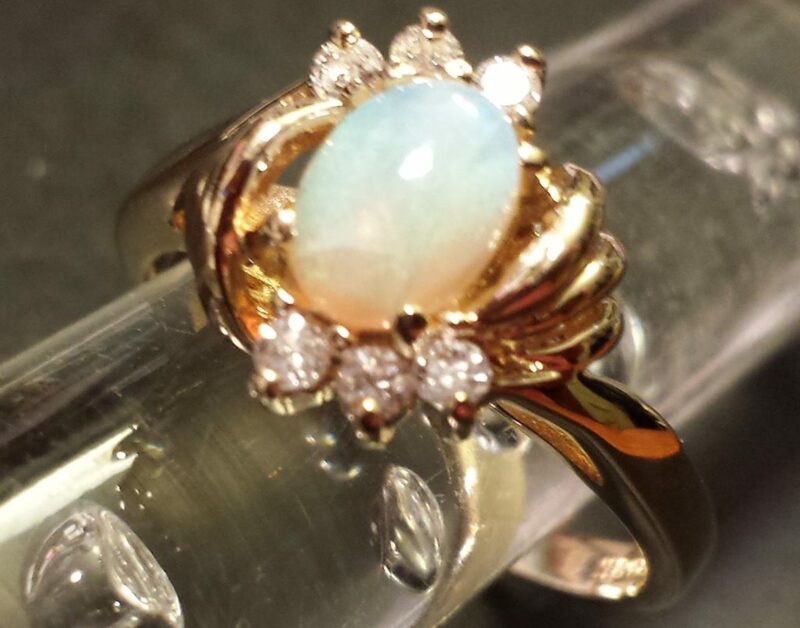 An opal set inside a bezel will require much more work than one held in place by four prongs. 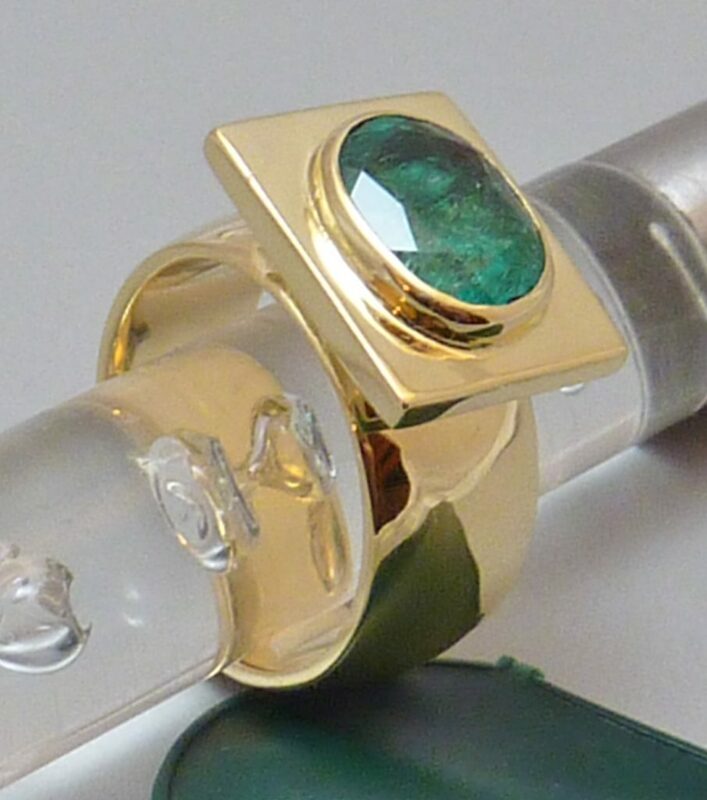 Oftentimes, bezels have to be cut open to remove the gemstone and then reconstructed once the ring is sized. But if the choice is doing this work and wearing your opal ring or just letting it sit in the jewelry box, it is worth doing. Channel settings are notorious for going out of alignment in the sizing process. This is especially true when sizing rings up or down by more than a couple of sizes. A good jeweler can deal with this. This could involve un-setting some or all of your gemstones. Once the un-setting of gemstones is done, then the sizing is done and then the needed work done to restore the integrity of your channel setting. At this point the re-setting of your gemstones is done. You may need to pay for broken gemstones from this process. Range of cost to handle channel setting ring work beyond sizing: $25 to $200. As you can see, there are as many factors to consider when sizing a ring larger as there are when determining what you’ll pay when going out to dinner at a nice restaurant. Check out my post on sizing a ring smaller and what is involved in that! Ring Sizing – What Do You Pay More For and Why? 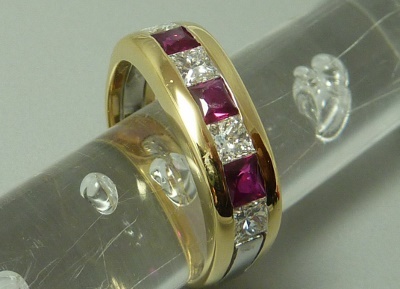 How Much Does it Cost to Size my Eternity Band Ring? How Much to Have My Enamel Ring Sized? Here’s the link to the companion blog post to this one: The Cost of Sizing a Ring Smaller. 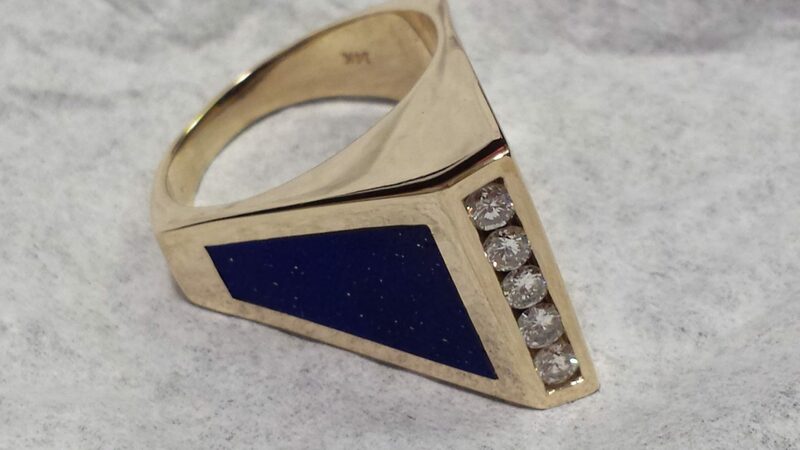 Calla Gold is a Personal Jeweler and Author who takes pride in working with clients one-on-one to integrate their personal sense of style and taste into custom designed jewelry and repaired jewelry pieces. Unlike typical Santa Barbara jewelry businesses, Calla Gold has no brick-and-mortar location. Calla Gold comes to you, bringing you the jewelry collection you want to see and collaborating with you to create unique custom jewelry. Calla also works with at-a-distance clients. Im planing on getting my mums wedding ring resized for her aniversary…it is a gold ring with about 3-5 diamonds in it how much would it cost to go up one size? I have a gold ring to be sized from 7 to 6 1/2 and another to be sized from 7 to 7 1/2. Can the gold from downsizing be used for upsizing? What will approximate costs be? Re: 15 gold rings, one to be up a half size and one to be downsized a half size. Approximate cost? I am thinking of purchasing an estate piece that needs to be sized from a 5 1/4 to a 71/2. It is set in heavy 14k white gold and has a few stones on each side of the band. Person selling the ring states it appears to have been resized previously. Can it be sized up? My engagement ring is a sterling silver band, with white topaz gems. It’s a size 6, and I need it sized up to a 7. Can you give me a ballpark figure as to how much that would cost? Thank you in advanced. If you ever dreamed of designing your engagement ring, need advice while shopping, or have another project in mind, this book will open the door to the possibilities and give you the knowledge and inspiration to see it to life. 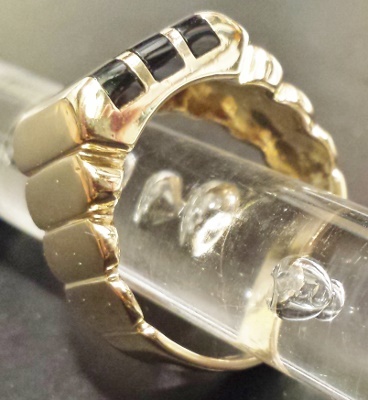 Calla Gold is a Santa Barbara Jeweler specializing in custom jewelry design and jewelry repair. She is available locally by appointment. And at a distance. Sign up to receive my jewelry tips, advice, news and more!